This week we had something in the family diary every single day. If it wasn’t someone coming to see us it was half days of one parent. Tot-school was often shorter because of this, sometimes happening in the evening and while we got through loads we actually spent less time than usual doing tot-school. Horses was a great theme though we identified well with all the H words and the now familiar word spinner proved popular. Hammers proved popular too and a renewed love for his toolbox has appeared. Glue. While Adam loves applying the glue he likes the loose pieces aspect and while he rarely repeats a craft he wants the option. Also the hammer activity with play dough under the sheet was great, but wobbly tees had us folding the play dough in half, twice, to get the right thickness! Will we do the whole alphabet? I’m hoping to cover the whole alphabet but planning to stop for December and do Christmas related bits instead. We travel mid December for 2 weeks with grandparents and would rather pause to enjoy other activities with family. 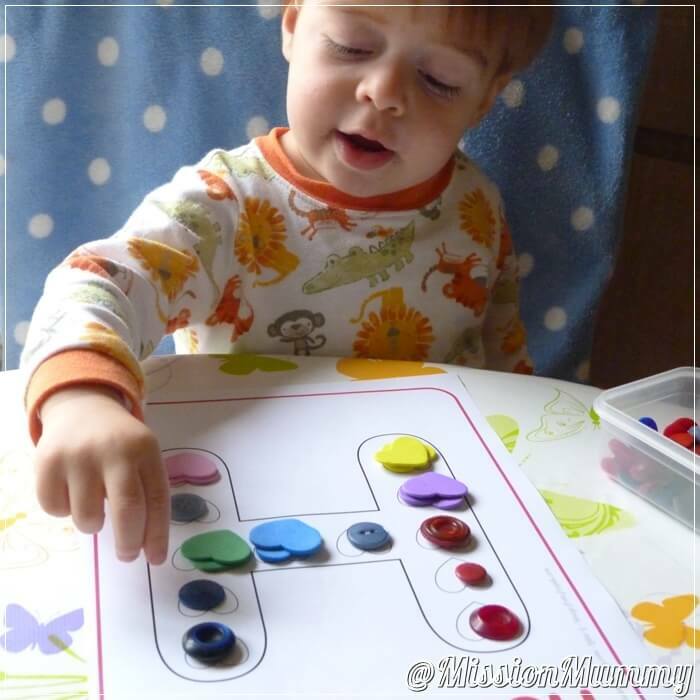 Adam spotted the H-hearts sheet early in the morning and had fun colour and shape matching. Later jigsaw pieces and farm sets gave us horses to springboard this week. We did well at identifying the other items on the letter centre sheets and the basic letter sheets gave us good practice at drawing inside the lines, something we’re just starting to notice. With so many creative bits lined up this week we did a ‘h’ for horse craft too. 1) ‘H’ is for Heart shape or dot sheet * with craft foam hearts. We kicked off with the letter spinner as Adam quickly identified 5 items to cut and glue. Our 9 piece puzzle was spilt into 4 pieces this week which entertained him for some time. As we were lagging a little I gave him the option of quitting of having buttons and out came a helicopter do a dot page from ‘A Gift of Curiosity‘. The dot markers returned today and Adam did great with the lowercase ‘h’ for house, though interest waned on the uppercase ‘H’ for horse. I’d hoped to try the play hammer with some golf tees but couldn’t find them so we did some outline matching with the hammer and other tools. I’d made this a while back but it had gone over his head, it was lovely to see it being used. 3) Plastic toolbox set and outlines. Working in the evening between visitors meant a late start with the capital letter house craft then revisiting the letter spinner and tracing mats. Extra time let us use the numbers 1-4 do a dot page from ‘A Gift of Curiosity to do some counting with buttons. We also used our foam puzzle pieces to make a jigsaw with the numbers 1-6. A really great day. While Friday is usually recap day I’d found the golf tees and play dough so we tried pushing them into our hammer page – a great activity but we needed more play dough! We also tried out the duplo alphabet mats from ‘123 Homeschool for me‘ which were lovely. As we’d done so well with our penmanship earlier in the week I’d made up a pre-writing page and Adam really excelled completing it. While mummy tidied up he played with crayons and the horse colouring sheet. Great resource for the alphabet! I really like your printables. Some different stuff from what I have found. Thank you!